The Northrop Grumman MQ-4C Triton HALE UAV of the Royal Australian Air Force. Photo c/o Department of Defence. 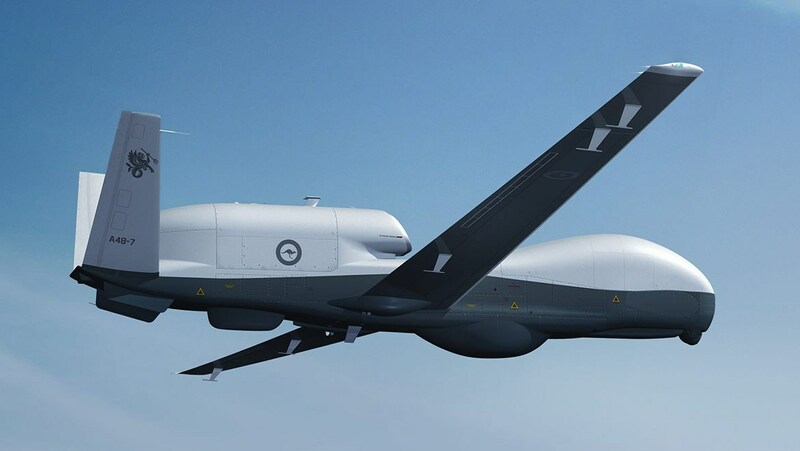 Australia confirmed that it has committed to purchase a second Northrop Grumman MQ-4C Triton high altitude, long endurance (HALE) unmanned aerial vehicle, out of its planned acquisition of six units. The purchase would be made under a cooperative program with the US Navy. The Royal Australian Air Force (RAAF) will use the MQ-4C Triton to complement the Boeing P-8 Poseidon maritime patrol aircraft fleet in maritime surveillance and electronic intelligence. Like the Poseidon, the Triton will be based at RAAF Edinburgh in South Australia, although it would be deployed on forward bases where the could be required. The RAAF plans to receive a total of 6 MQ-4C Tritons by 2025 under the Project AIR 7000 Phase 1B. It was designed to allow the RAAF to undetake enhanced intelligence, surveillance and reconnaissance tasks. It will be used for a wide variety of tasks including maritime defense, and combating human smuggling and exploitation of maritime resources.